Greece, officially the Hellenic Republic, is country located Southern Europe neighboring Macedonia, Albania, and Bulgaria. Whether traveling for a luxury vacation, business, or special event, our Greece private jet charter service can arrange a luxury jet to/from any travel destination in Greece and neighboring areas. Travel to Southern Europe using our Greece private jet charter service and arrive in style! Our charter brokers can also arrange ground and yacht transportation for your convenience once you arrive into the Greece. Fly privately into one of the following destinations within Greece. This list of destinations is based on Jet Charter Europe clientele requests, local attractions, and online reviews. Many of our clientele choose Athens, Fira, or Chania Town as their travel destinations when flying privately to Greece. 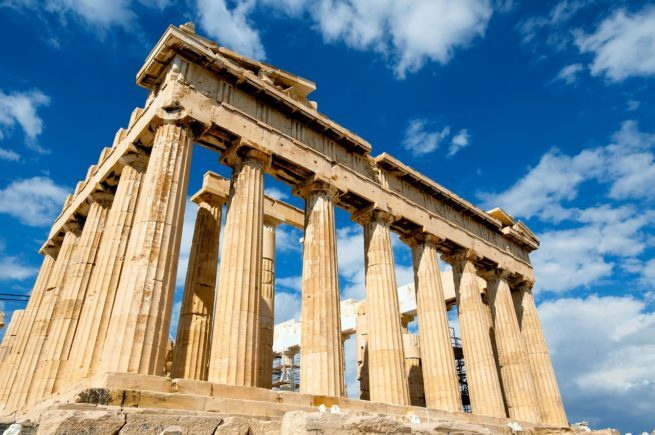 Athens is one of our most popular European destinations for private passengers and a top city to visit in the world. Greece also has some of the most pristine beaches in all of Europe, especially Elafonissi Beach in Crete. Ideal months for Greece travel is during warmer months late spring (April-May) and early fall (September-October). While the peak of travel is during the summer (June-August), visitors will find less crowds and more relaxing weather during spring and fall.